Ayers Basement Systems is an independently owned PolyLevel dealer, providing their professional concrete lifting services to residents all throughout Central and Western Michigan. Sure-Dry Basement Systems is a locally-owned and operated foundation repair and basement waterproofing contractor serving Northeast and Central Wisconsin. Since 1994, they have been dedicated to helping homeowners repair their wet basement and crawl space problems, as well as foundation issues caused by bowing, settlement, and sinking. Northland Basement Systems are the local experts for concrete leveling and repair in Wisconsin and Michigan. 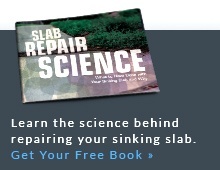 Fix your cracked, sunken concrete slab with a proven solution! Get a free estimate for PolyLevel concrete leveling in Ashland, Houghton and nearby. Conditions where outdoor concrete has already begun to sink is not uncommon in Michigan and is often the result of shifting or a weak soil base or erosion. It causes driveways, sidewalks, walkways, concrete steps or patio areas to become tripping hazards and can effect property value. Michigan, also known as The Great Lakes State, hosts a variety of soil types, ranging in density and load-bearing capacities. From the forests in the upper peninsula to the mountains in the west to the level lower peninsula, the geological formulation of the state is quite diverse. Today, select contractors in Michigan are trained and to provide a better alternative to mud jacking. PolyLevel is a less intrusive, lighter weight solution that doesn't add more weight to the problem. If you are seeing signs of sinking concrete on your property, have a contractor to provide the PolyLevel alternative to mud jacking take a look at it. 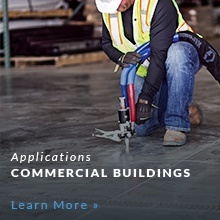 The following Michigan contractors are trained and to provide a free estimate to solve your sinking concrete problem. "The products you use and Mr. Virgil Ayers. We received several proposals..."
"Quite favorable, polite and paid attention to the job." Quite favorable, polite and paid attention to the job. "They were very professional and answered all questions"
"The two young men were very hard working men. They were very polite..."
The two young men were very hard working men. They were very polite considering the work they were doing. "The crew was very professional. They made sure I understood what they were..."
The crew was very professional. They made sure I understood what they were doing and how it works. "They offered the poly level system and the price was very reasonable. I..."
"Very courteous answered all my questions"
Have a home sale and the buyer is adamant that a cracked portion of the concrete be raised prior to closing. We are running out of time and I'm hoping you can help me solve this. Please let me know as soon as you can. Thank you! I am looking for an alternative to removing a rather large area of concrete patio. Irrosion from water and ground squirrels is significant . Please advise . Our house is on a slab. We are noticing some major sinking and sloping both inside and outside. We need your assistance asap. The steps to my front patio have been misleveled for a while with an obvious gap between the top of the steps and the patio, would like it to be leveled. Sunken sidewalk slab leading to front door. We have a floor shifting in our plant under one of our process lines. We would like for someone to come in and take a look and give us a quote. I have an approximate 15 X 20 patio that is 4 sections of stamped concrete that is sinking. The landing at the front door of the house has started dropping down on the west side. also the second section of the sidewalk has dropped and both need to be raised and leveled. Driveway is sinking and collapsing near house foundation. Water collects in the depression and makes it's way into the basement. Concrete driveway makes a pool of water that freezes in winter. Slabs are sunk so the center of the driveway has a depression that gathers the water. Sunken walkway, would want it looked at. also, 2 slabs in front of garage is cracked, and are making a V in the middle. Makes it a river when heavy rains fall. We recently bought this home. The driveway concrete has settled creating very uneven slabs. The sidewalk also has some heaving. I am concerned about the trip hazard this creates. Part of my garage floor has sunk, and I'm wondering how much it would cost to have it raised back up. I have a 10' X 10' concrete slab outside my sliding door that has settled and water is running toward my foundation. Garage apron and floor sinking and needs repaired. Concrete side porch/stoop with four concrete steps is slanting away from the house. Sunken concrete driveway pads and cracks in the concrete. Need someone to come out and polylevel front steps into house. Set of concrete steps leading to front porch are sunken and would like to have them raised. 6ft X 10ft patio slab, settling towards foundation Tilt collects water against foundation. We have a portion of our driveway the has sunk. We would like it lifted. Garage cement floor is cracked and sinking on one side about 4.5 inches. May have been poured badly back in the day or simply sinking over time. Would like an estimate on how to regain level without the need to repour or grind down existing concrete. 500 sq/ft cabin. All interior walls removed, crack thru center of structure. Crack at highest point is about 1/2" difference between the 2 slabs. can you jack level again so I can tile. One slab in front of my middle stall. Front porch steps and adjacent driveway are sloping toward the house. Please give me a call would like to discuss having this done ! Comment: Have a home sale and the buyer is adamant that a cracked portion of the concrete be raised prior to closing. We are running out of time and I'm hoping you can help me solve this. Please let me know as soon as you can. Thank you! Comment: I am looking for an alternative to removing a rather large area of concrete patio. Irrosion from water and ground squirrels is significant . Please advise . Comment: Our house is on a slab. We are noticing some major sinking and sloping both inside and outside. We need your assistance asap. Comment: The steps to my front patio have been misleveled for a while with an obvious gap between the top of the steps and the patio, would like it to be leveled. Comment: Sunken sidewalk slab leading to front door. Comment: We have a floor shifting in our plant under one of our process lines. We would like for someone to come in and take a look and give us a quote. Comment: I have an approximate 15 X 20 patio that is 4 sections of stamped concrete that is sinking. Comment: The landing at the front door of the house has started dropping down on the west side. also the second section of the sidewalk has dropped and both need to be raised and leveled. Comment: Driveway is sinking and collapsing near house foundation. Water collects in the depression and makes it's way into the basement.